Tables bases win a choice of three heights. Designed for use where the table is fixed to the floor for added safety and security. Available from stock for a free and fast delivery. Specialist table base manufactured in three standard commercial sizes Coffee, Dining and Poseur height. 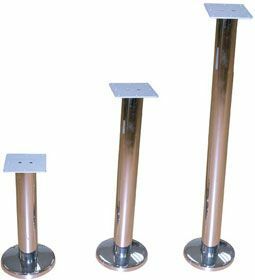 This table base is popular in bars and upmarket cafes. Please note that the fixings are not included, please contact our sales team if you require any further information on this product.